Crime Watch: Kiwis love crime fiction, but what about our own? Kiwis love crime fiction, but what about our own? A few months ago I wrote an article for the 'Soapbox' section of the New Zealand Book Council's excellent quarterly publication Book Notes, about New Zealand crime fiction. In the article I noted that local readers do have a large appetite for crime fiction, but traditionally we have been pretty poor at reading local authors in the genre. "When will New Zealanders embrace locally penned tales of murder, mystery, and mayhem?," I asked. Since I wrote the Book Notes article some of the things I addressed have been further evidenced by specific statistics and other comments and observations in excellent articles by Mark Broatch in the Sunday Star-Times (read here) and Philip Matthews in Your Weekend (read here). In particular, I found it very interesting that my comment about the popularity and dominance of crime fiction on New Zealand's international bestseller lists as compared to how much we buy and read our own authors was borne out in Broatch's article by Neilsen Bookscan statistics showing that crime was probably the most popular type of fiction reading for New Zealanders last year (taking more than 30% of the market), but less than 1% of the crime novels sold here were written by locals. This is an appalling statistic, especially given the quality of some of the crime fiction being produced by local writers. But what might be some of the reasons for this shockingly low level of support from the buying public? Is it the way our writers are publicised? Cultural cringe from the readers? Or something else. In my Soabox article in the Winter issue of Book Notes, I took a look at some possible reasons, and the reality behind the perceptions. The article can now be read online. Click here to view the article. Why do you think New Zealand readers haven't yet truly embraced our great New Zealand crime writers? Are things improving? Is there a realtive lack of support for crime writers from the books industry, or at least some parts of it? What more could be done? Is this even an issue/should we care? I'd love to read what you think about all of this. Please share your comments. Craig - Not being a Kiwi, I can't speak intelligently about Kiwi readers. I do know that local authors in the part of the U.S. where I live often don't get a lot of local support, either. In part (at least in my humble opinion) it's because of the media blitz by internationally-known authors who have deep marketing pockets. But, as you point out in your article, it's also a matter of making people aware of local writers' talent. I think it's probably a bigger issue than just crime fiction Craig, it certainly is in Australia anyway. In the arts generally the big cultural references are American then English regardless of whether we're talking TV, movies, music or literature of any kind (including the 'proper' stuff). We are getting a little bit better at supporting local content - there are usually 1 or 2 local films that are hits each year and perhaps a TV show too but when you look at the total content available in any of those markets it is primarily not local. Some of the reasons are size-related - not necessarily that we can't produce good writers or movie makers or whatever but we tend not to have the companies that can churn out the publicity machine to support this stuff in any sustained way. It's partly money but it's partly the know-how and the channels as well. Every time a new Patterson novel is released there is a whole workflow of ARCs being sent to key outlets and follow-up calls to the big influencers like morning TV shows and a myriad of other stuff that means the average person cannot miss seeing a reference or two even if they're not paying particular attention. I am hopeful that the internet will slowly help to change this. Locally produced music gets supported probably more than other arts because a few people in the general public see bands play in their local pubs and then request the songs on radio then the bands get to play bigger venues and more people hear about them and on the cycle goes - in some ways blogs are a bit like these pubs - a few people will see and hear about a new local author on your blog then they might start requesting their book stores stock the stuff so then more people see the local content and so on. Excellent points. I think you're right in what you say about Aust/NZ (and this probably happens in Canada a fair bit too) being heavily influenced by US and UK entertainment culture. There's no getting away from that. I guess the point about NZ and crime fiction is that it seems we're even worse at supporting our local crime fiction than we are other types of writing. I believe the sale for NZ fiction or NZ books in general are more around the 5% mark - so for local crime fiction to be at the 1% mark is particularly bad. I love your analogy of blogs as the books worlds pubs Bernadette - what a fantastic title for an article or blog post. I may even have to steal it if I do such an investigation ;-) And I think you could well be right too. Music is an interesting comparison, and one I've been using myself in various discussions here in NZ about supporting our NZ writers in general, and our NZ crime fiction writers in particular, much more. Radio play, sales, and exposure for NZ music seems to have increased a lot in the past decade plus. And maybe it is easier for music than books. But it wasn't long ago a lot of people thought NZ music rarely if ever stood up against the international stuff. Now people realise that even if our singers and bands aren't splashed all over Rolling Stone and the Grammys, they are still high quality and can hold their own, in terms of music if not international sales. And the really cool thing (and the point I use as an analogy) is that we support all different kinds of music across the board - from hard rock to pop to hip hop to roots to classical etc. Kiwis are proud of Shihad and Hayley Westenra. We support Gin Wigmore and Scribe (and Stan Walker, who's half ours at least ;-0). Op Shop and Smashproof. There isn't as much of a 'literary vs popular fiction' divide here in the music world, anymore. The 2010 Vodafone Music Awards that were held last night were a great example. And that's what I'd like to see in terms of NZ crime fiction - that people who enjoy that 'type' of writing support it and are proud of it, and that everyone overall is supportive and encouraging of all our writers, no matter what genre they write in (just like we are with our musicians, no matter what style they compose in). I have to confess I'm kiwi who loves reading crime fiction but has been painfully ignorant of local crime writing until very recently. I've long been a fan of Ngaio Marsh but other than that I haven't read much NZ crime fiction, largely because I wasn't aware of how much there is and, more importantly, how good some NZ crime writers are. 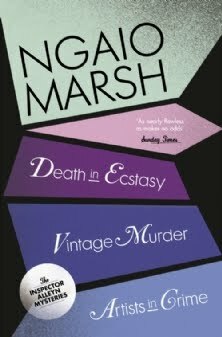 I think reviews and blogs like yours are helping to make kiwis more aware of the great NZ fiction out there and the Ngaio Marsh is another great step in raising the profile of NZ crime authors. "I don't want to read a book set in NZ." "I see the displays of kiwi authors books and they look boring." "It's about NZ by a NZer - it doesn't interest me." "Why do book shops put kiwi authors all together and not in their genres? If the books were up there on the shelf with Eisler, Deaver and Childs, I'd know they were thrillers." Now what I don't understand, is why people react so badly to NZ authors. Sure we all had to read boring poetry at school because it was written by some kiwi or other, and the dreadfully droning short stories that we were forced to dissect - but should that cloud our thinking as adults? Are we tainted by the perception that kiwi's write about NZ and only NZ and therefore it's not interesting? I don't have enough NZ content in my books to be published here despite Penguin NZ telling me I have talent and loving my work! Getting published here means writing about NZ, it's limiting but it's also insane because people are not buying local authors - it doesn't look to me like people read or want crime fiction set in NZ. You hit upon my pet peeve Craig the utter lack of support for kiwi authors here at home! Following on from Cat's comment, I'd say grouping all NZ fiction together in the bookshop does not help. I went to pick up a copy of 'Surrender' by Donna Malane yesterday and had difficulty locating it. I'd assumed it might be in the New Release section or possibly in prominent display in the crime area. I must have looked a little lost as a shop assistant came over to offer help, but she had no idea about the book and had to look it on the computer. We did then locate a large pile of copies buried in the bottom corner of the NZ Literature section. Surely given the number of books they had, they could have placed copies in the crime section as well as NZ? Many people (myself included) tend to browse the sections of bookshop of the genres we like to read. I worry that segregating NZ authors from their genre is implying that you have to be interested in reading a New Zealand book specifically as opposed to just an appealing book which happens to be written by a NZ author. I hear what you're saying Debbie, and agree in many ways. I guess the flipside is that if people want to give NZ fiction a go, but it's threaded throughout the genre shelves, then many people may not try it because they will be lost amongst all the authors there - and many people will just focus on the 'big name' internationals. So putting Kiwi authors into the A-Z or crime sections (which some bookstores do) could be a double-edged sword. In the end, we just have to find a way to highlight it - whether it's prominently displayed in the genre categories or a separate NZ section (as long as the NZ section isn't ghettoised, as it is in some stores). Perhaps little silver fern stickers on the spine, for books in the general sections? Shame about your experience with SURRENDER. It has seemed very hit and miss with the Borders and Whitcoulls stores who are stocking it. I saw a couple of Whitcoulls who had it prominently displayed near the registers, making it something of an 'impulse buy' at its very reasonable cost, but then another one I went into had it stacked at the very back of a table, hidden by piles of big name bestsellers. But the store still thought they were 'promoting' it just by piling it on the table, without any posters, highlighting, references to its prize-winning status, NZ status, or good price etc. Sigh. Some great insights there Paul, and thanks to you and Cat for sharing the author perspective. I can't even imagine how frustrating it must be to see how little (some) local booksellers support, promote or highlight locally-written fiction. I still remember seeing that huge stack of your books at the Cologne airport last Christmas, in between the likes of Stephen King and Peter James etc, and then coming back here to New Zealand and going into plenty of bookstores that didn't have many, if any, of your books. Maybe a copy here and there. A valid point about the financial means of our local publishers (or local offices of the international publishers). That's something that is going to be an ongoing battle, so I guess we just have to find other ways of getting around those constraints. The funny thing is, talking to authors like Val McDermid and Michael Connelly lately, they started out getting very little publicity, sales, or support - but just kept grinding away, and eventually 'broke through' after several books. So hopefully if authors, publishers, booksellers and others here all just keep going, and stay the course (rather than pulling the ripcord at the first sign of low sales), things will get better and better. It's an interesting point about the reviewers too. I've seen several very positive reviews from Kiwi reviewers about locally-written crime fiction, but I hear what you are saying - and there are certainly some reviewers out there who seem to enjoy looking down their noses at locally-written work, especially the popular stuff. Hopefully this has been improving lately. Although reviewers have to be honest, and say if they don't like a book and why, I don't particularly appreciate reviewers who seem more interested in showing how 'clever' they are, or how scathing they can be, rather than just reviewing the book and explaining why they felt how they did about it. Please kick me if I ever write a review like that. Could it be that readers don't know about Kiwi crime novels? If Whitcoulls and PaperPlus don't stock us, and Listener won't review us, people will continue to think murder mysteries get written in England and USA. Thank you, Vanda, for making me laugh. All the rest was kinda heartbreaking, and I guess deleting by accident was heartbreaking, too, but there you go. I laughed. Interesting about the bookshop displays. I have the same grudge about libraries. My Wiki Coffin mysteries are never in the mystery section. Instead they are in the general fiction section next to Marilyn Duckworth, who is my very good friend and a great writer but hardly the same genre. And that symbol for "NZ literature" on the sticker at the bottom doesn't help. Personally, I put it down to the cringe factor. Kiwi-produced stuff can't possibly be as good as US or UK stuff etc. etc. Even when compared to the most utter potboiler. An even worse crime is writing for a foreign audience, as if you are selling your country out, or something. Great comments guys. The cool thing is, whenever I've recommended a Kiwi crime novel to any readers, here or overseas, I've pretty much had unanimous positive feedback. The readers like the books, once they hear about them and give them a chance. And if you don't have that, you don't have anything. Kiwi crime writers have that, so it's just a matter of slowly getting the other things coming around - at least it's something to build on. The attitude towards New Zealand thrillers seems like a hark back to the 1960s when almost anything imported from overseas was considered better than something built or created in New Zealand, except of course the All Blacks! The country has grown immensely in sophistication since then and is of course a world leader in many areas including the arts and especially movies so why the hang up about thrillers ? Peter Jackson started the film revolution in this country with movies like 'Bad Taste' what a name and what a gruesome movie, and there have of course been heaps of other excellent New Zealand movies and great script writers so we have the talent here without doubt. The weakness in this thinking is the success so many New Zealand thriller writers have had in far bigger international markets. Most thriller writers do not put pen to paper just for an intellectual elite but for a much wider audience so the judgment should be on how best they achieve that objective as well as how well they are written. I can say my modest offering has been treated kindly in Northland in New Zealand with friendly write ups and notes of appreciation and also at Marlow Buckinghamshire, England where I used to live many years ago and is the region my novel starts at. So I really appreciate the words of encouragement etc voiced by the local media in those places and also the great efforts of Craig and co. The point here is that your own local press and community can be very supportive and take pride in having an author in their midst. Clearly this is insufficient to make a mark in the book selling market or get past those gate keepers of New Zealand literature but it helps.
' We always have room for a good story', and he did. That is all a writer wants to hear and to know that if you turn in a good thriller there will be room for it and sales commiserate with its literary worthiness. I am sure Craig has come up with a superb blog site and a support group of very competent and worthy thriller writers to back the cause. The objective of thriller writers is to scare the pants off the readers so they are too scared to put the lights out when they go to bed at night or keep them up all night turning pages anxious to discover who dunn'it. The Ngaio Marsh Award is a great move to help acceptance of the genre in NZ. As I have read all finalists, I am looking forward to hearing who wins. Let's hope the Award gets strong national publicity. totally agree with the points you made. As a voracious reader of internation crime fiction I'm hardly in the position to be scathing of people who don't buy local thrillers, but I think there are a couple of reasons overseas crime tends to dominate sales: I think alot of it's cultural cringe factor, in that people seem to think something local is going to be uninteresting, and in contrast something from overseas is going to provide something jaw-dropping. I guess the other factor is that people do judge books by their cover. As well-designed and appealing as NZ covers may be, it's incredibly difficult to compete with a beautifully-designed international trade paperback stamped with a glowing review from the New York Times.